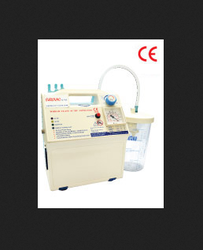 Manufacturer of karman type cannulae, eurovac elite etc. 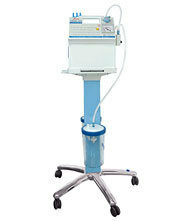 Mobile Suction Unit compatible with Central Pipeline Vacuum outlets. 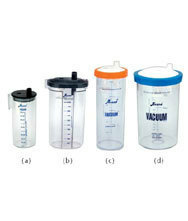 Provided with compatible adapter, 4 collection jars with disposable liners (2 Ltr. 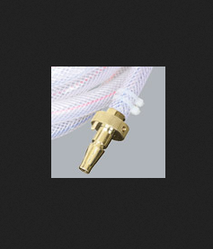 each), regulator etc. Anand's oil free diaphragm pump on trolley housing: engineering moulded abs plastic box capacity: -700mm hg 10 vacuum, 35 ltrs/min. pump type: double diaphragm pump jars: wide mouted 2 x 2 ltrs ( polycarbonate) with two-way changeover lever and safety jar with mechanical/electronic overflow motor shut-off system and bacterial filter. tubing: 8 mm id x 2 mtr (silicon) vacuum gauge: 6. 25 cms ( 2. 5 inch). 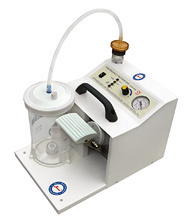 0-760mm hg calibration power: 220 v ac, 50/60 hz, 125 watts. (110v on request) dimension & weight: 39 x 55 x 119 cms. 18 kg (with trolley) controls on working height with extra pedal-operatable switch. trolley with non-marking castors having brake facility. Anand's high vacuum suction unit - india's first isi marked suction apparatus. . housing: spot welded, oven baked cabinet capacity: -700mm hg 10 regulable, flutter free vacuum control knob, 28 ltrs. /min. 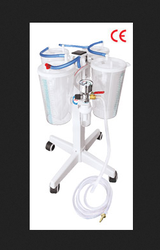 pump type: single rotary vane pump jars: wide mouthed 2 x 2 ltrs. (polycarbonate) with self sealing bungs and mechanical over flow safety device. turbing : 10 mm id x 2 mtr (pvc) vacuum gauge: bourden type 6. 25 cm. Dia. 0-760mm hg (also inches) calibration. power: 230 v, 50 hz, 2 0. 5 amps, 200 watts. (110v on request) noise level: 50 db a 3 almost whispers. dimension & weight: 39 x 33 x 65 cms, 25kg. The portable powerhouse housing: engineering plastic moulded, shock-resistant abs with 2 size hooks to hold tube. capacity: -700mm hg 10 vacuum, 35 ltrs/min. 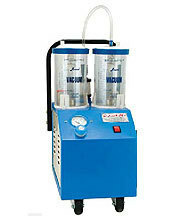 pump type: double diaphragm pump jars: wide mouthed autoclavable 2 ltr. Collection jar (polycarbonate), with mechanical over flow shut off system and bacterial filter. tubing : 8 mm id x 2 mtrs (silicon). vacuum gauge: 6. 25 cms. (2. 5 inch). 0-760 mm hg. Calibration. power: 220 v ac, 50/60 hz, 125 watts. (110v on request) dimension & weight: 20 x 42 x 36 cms. 8. 5 kg. 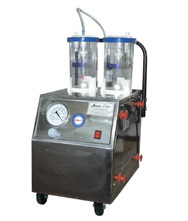 Anand's high vacuum-high flow suction unit - 90 ltr housing: plastic moulded cabinet capacity: -700 mm hg 10 mm regulable, flutter free vacuum control knob, 90 ltrs/ min pump type: double piston pump jars: 2 x 2. 5 ltr. Wide mouthed (polycarbonate) with changeover lever. 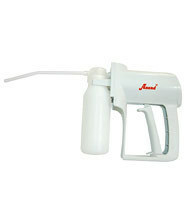 Provided with handle for hygiene while emptying/cleaning. 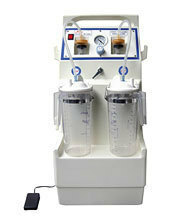 Safety jar with mechanical / electronic overflow motor shut off system and bacterial filter. tubing: 10 mm id x 2 mtr. (pvc) vacuum gauge: bourden type 6. 25 cm dia 0-760 mm hg calibration. power: 220 v, 50 hz, single phase noise level: 60 db a3 dimension & weight: 46 x 32 x 86 cms, 23 kg. 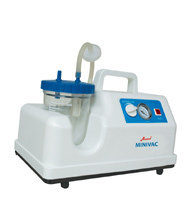 Anand's high vacuum-high flow suction unit - 30/65 ltr housing: plastic moulded cabinet capacity: -600 mm hg 10 mm regulable, flutter free vacuum control knob, 30/65 ltrs pump type: double diaphragm pump jars: 2 x 2. 5 ltr. Wide mouthed (polycarbonate) with changeover lever. Provided with handle for hygiene while emptying/cleaning. 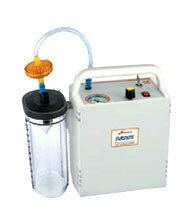 Safety jar with mechanical / electronic overflow motor shut off system and bacterial filter. tubing: 10 mm id x 2 mtr. (pvc) vacuum gauge: bourden type 6. 25 cm dia 0-760 mm hg calibration. power: 220 v, 50 hz, single phase noise level: 60 db a3 dimension & weight: 46 x 32 x 86 cms, 23 kg. 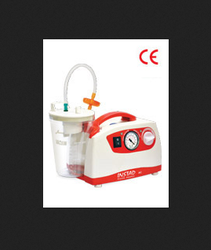 Light weight portable suction unit housing : easy to clean plastic capicity : -570 hg (0. 075 mpa) -12 ltr/min. 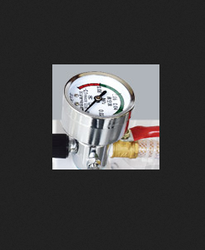 pump type : oil -free piston pump. jars : 1 x 1 ltr autoclavable jar (polycarbonate) with over flow safety device. 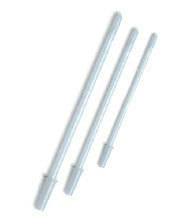 tubing : 8 mm id 2 mtr with 2 disposable suction cathetors. power : 220 v, 50 hz, 70 watts. noise level : 55 db a dimension & weight : 38 x 25 x 27 cms. 3. 5 kg. 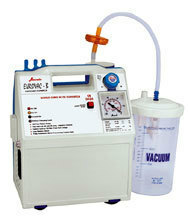 Anand's real portable unit with shock resistant abs case. compact, lightweight, powerful and non-corrosive housing: engineering plastic moulded, shock-resistant abs with 2 size hooks to hold tube. 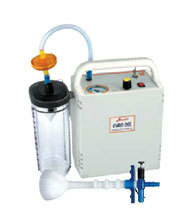 capacity: -575mm hg 10 at 25 ltrs / min. pump type: single oil-free diaphragm pump mechanism provides reduced maintenance cost. jar: wide mouthed autoclavable 2 ltr, collection jar (polycarbonate), safety jar with mechanical/electronic overflow motor shut-off system with reusable or autoclavable bacterial filter. tubing : 8 mm id x 2 mtr. (silicon) vacuum gauge: 6. 25 cms (2. 5 inch). 0-760mm hg calibration. power: 220v ac, 50/60 hz, 125 watts. (110v on request) dimension & weight: 20 x 42 x 36 cms. 7. 5 kg. good for different clinical / medical / surgical procedures. necessary tools for maintenance / replacement and spares provided. 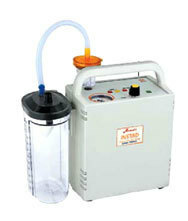 Anand's portable ac/dc suction unit housing: engineering moulded, shock resistant abs plastic capacity: -575mm hg 10 vacuum, 14 ltrs/ min pump type: oil free piston pump. jars: wide mouthed autoclavable 2 ltr. Collection jar (polycarbonate), safety jar with mechanical/electronic overflow motor shut-off system and overflow bacterial filter. tubing: 8 mm id x 2 mtr (silicon) vacuum gauge: 6. 25 cms. 0-760mm hg calibration. power: operates on 220 v ac and 12 vdc inernal battery, 7. 2 ah. (110v on request) dimension & weight: 20 x 42 x 36cms. 9 kg. battery backup: 120 minutes on full charge: in built maintenance-free battery. provided with cable for ac mains and ambulance/car use. Transparent moulded yankeur suction handle attached with two & half meter long p. V. C. Tubing suitable for easy attachment to any type of suction apparatus. 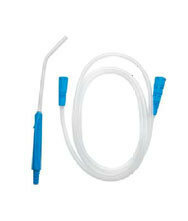 A port is provided at the distal end of the handle for finger tip / thumb control facility during suction management. 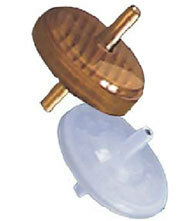 Yankeur handle is open with four lateral eyes to withstand negative pressure and ensure continuous and easy suction available with / without filter. e. T. O. Sterilized and pyrogen free. 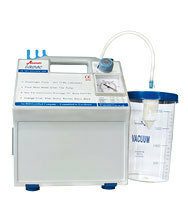 Safe birth assistant, minimizes risk of trauma and cephalohematome of fetal cranium, sterilizable - 50 mm, 60 mm & 70 mm cup, connectable to any suction unit with gauge & release valve. Specially designed for aseptic menstrual termination of pregnancy, distal end is coned with two large lateral eyes to facilitate the curetteage, suitable for use with mtp syringe or suction apparatus, sterile, individually packed in peelable pouch, e. T. O sterilized and pyrogen free. 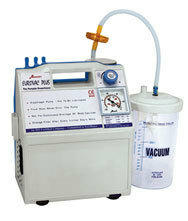 Anand's portable ac/dc and pedal suction unit for ambulances, hospitals, camps, trains, home care etc. housing: ms powder coated cabinet capacity: electrical: 0 - 575 mm hg 10, vacuum 14 ltr/ min. pedal: 200 ml per stroke volume pump type: oil free piston pump (electrical) & piston pump (pedal) jar: wide mouthed autoclavable 2 ltr collection jar (polycarbonate), safety jar with mechanical / electronic overflow motor shut off system and bacterial filter. tubing: 8 mm id x 2 mtr. 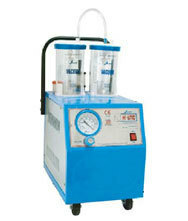 (silicone) vacuum gauge : bourden type 5 cm dia power: electrical: operates on 220 v ac and pedal (manual). In-built maintenance free 12 v dc battery. 55 watts. dimension & weight: 44 x 28 x 27 cms, 9. 5 kg. battery backup: 120 minutes on full charge. 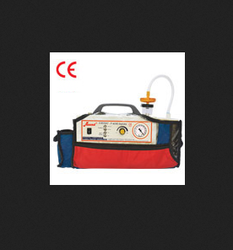 provided with ac adapter and cigarette lighter socket cable for use in ambulance / car. Can be hung in ambulance or on wall.